Triple Glazing Can Help You Have a Passive Home. Your home is where you spend a significant portion of your life. This is where you get to stay in comfort with your family and have great moments together. As a homeowner, you always want what is best for the whole family and what better way to do this than triple glazing. Triple glazing increases the energy savings in your home while improving the quality of the indoor air in the home. In the next couple of sections, we will be taking a look at some of the ways in which triple glazing can help you have a passive home that you and your family will live in comfortably. We will also take a look at how you can get started immediately with triple glazed windows in your home. Investing in high performance triple glazed windows is a great decision considering the fact that windows account for more than 50% of all energy loss from a building. This way, you get to lose less energy and you can even have a smaller heating system. Your home is where your family spends their lives in and it is important that they do so in comfort. This thermal comfort is usually impacted by the quality of windows you have installed. Thermal comfort is not to mean that your home will always be warm. As a matter of fact, having triple glazing can make your home much warmer during the winter and cooler during the summer. You also get to reduce the energy loss from your home so you don’t have to spend a lot of money on heating and cooling bills. The design of the window frame also matters when it comes to a passive home window. This needs you to have only the best trained and experienced professionals installing the windows for you. When you are looking for a company that makes and installs triple glazing, you need to make sure that they are willing to take the initiative to give you an initial visit and estimate before you can make your final decision. This allows you to get more information about the glazing during the survey visit and be in a position to make the best decision. Working with The Advanced Group ensures that you benefit from this and so much more. With only the best professionals at your service, your home will never be uncomfortable again. 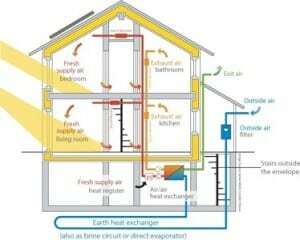 You can even book a free home survey visit with us so that we can take a look at your home and provide you with suggestions on what can be done in order to increase energy efficiency and increase thermal comfort in your home. We provide high quality triple glazing with low conductivity spacer systems that will ensure maximum energy efficiency and avoid heat loss through the windows. We also do the installation ourselves so you do not have to lift a finger. Get in touch with us today and book a free home survey visit. We have a price guarantee meaning that you don’t pay any deposit and only pay when you are satisfied. Triple Glazing Can Help You Have a Passive Home. Give us a call at The Advanced Group today on FREEPHONE 0500 338 488 to find out more and to get a FREE consultation with a helpful member of our team. Or Simply complete the enquiry form on this page.